Foxconn Technology Group plans to purchase a building directly across the street from Wisconsin's state Capitol in downtown Madison. To a small crowd gifted bright red "WISCONN Valley" hats, the Taiwan-based electronics giant along with BMO Financial Group announced Friday it will buy the 55,000-square-foot building for an innovation center, called Foxconn Place Madison. BMO has a branch on the main floor and it will remain there. The sale is "imminent" but not yet finalized, said David Casper, BMO’s United States CEO. He would not disclose the price. The announcement comes amid growing uncertainty and concerns over Foxconn’s progress and presence in the state. "It’s good news for BMO, it’s good news for Foxconn, and it’s good news for Madison," Casper said during the presentation. Foxconn is building a manufacturing facility near Racine where it says it will produce liquid crystal display panels. But the company has been besieged with doubters about whether it will fulfill its promise of hiring 13,000 people for the project. Alan Yeung, director of U.S. strategic initiatives for Foxconn, seemed to acknowledge these concerns, unprompted, during his announcement. "I can assure you that Foxconn will be a good neighbor," Yeung said. "I also can assure you that building will not be an empty building." Later, when asked to respond to an article by The Verge — which catalogued organizational opacity, confusion and stalled development around the state — Yeung said the article "has a lot of inaccuracies" and Foxconn will issue "a correction" and "a statement." "We don’t actually make an effort to acquire buildings to leave them empty," said Yeung. "But we also don’t want people to climb up on trees and look over to make sure that we have occupancy." Charles Hoslet, UW-Madison’s vice chancellor for university relations, said the Foxconn center will help faculty and researchers in numerous fields "spark technological advancements" and "expand opportunities" for students. "I’m especially excited about Foxconn’s commitment to recruiting on our campus," Hoslet said. The partnership extends beyond the new building. Hoslet said Foxconn has supported UW-Madison through a sponsored research agreement in the College of Engineering and through a $100 million gift, which Hoslet said will mostly go toward a new building on the engineering campus. 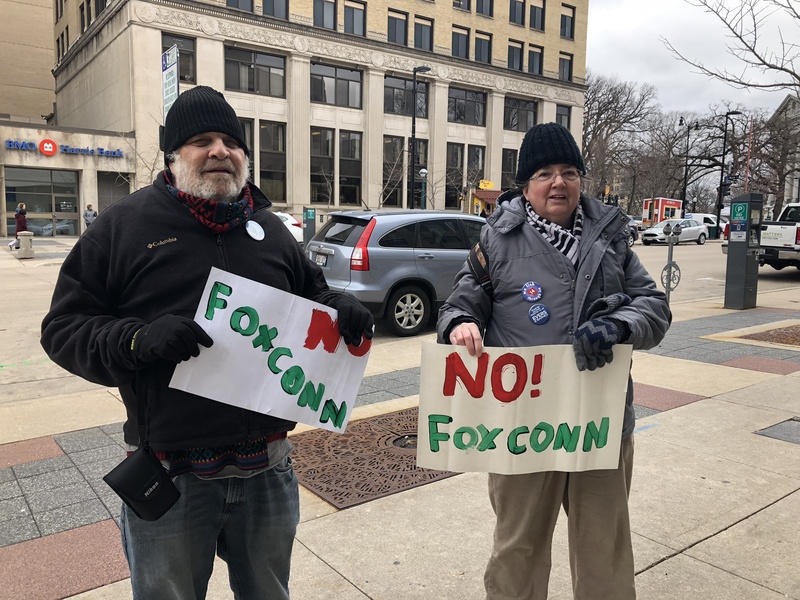 Outside the soon-to-be Foxconn building were two long-time Wisconsin residents, carrying hand-painted signs reading "NO! FOXCONN." Genie Ogden said she opposes Foxconn’s acquisition of land from residents in southeastern Wisconsin, as well as the potential environmental impact. Mitchell Nussbaum bristled at the partnership between Foxconn and the UW System. "It seems like they’re buying a piece of the university rather than, you know, a research grant," said Nussbaum. "It’s like they’re hiring the university to do research for them and that’s not how universities are supposed to work." Editor's note: This story was updated with original reporting by WPR staff.